We’ve all been there. You get that perfect view of the Eiffel tower, and there’s a person, car, or trashcan front and center photobombing an otherwise perfect shot. So how in the world do bloggers always seem to get popular sites empty and free of photobombers? The truth is that we don’t (although we’d like you to think we do). The key to editing an Instagram like a blogger is to use the right tools and a little practice. In full disclosure, I have no formal experience or training in graphic design or photography. It took me a while to figure out which tools worked best for me to edit my Instagrams especially because I have no technical background. My favorites are the Lightroom, Photoshop Fix, and A Color Story iPhone apps. If you only use one app for editing, it should be Lightroom. Lightroom is excellent for straightening/cropping, adjusting lighting and color, and making minor tweaks like sharpening a slightly blurry image. I use the free version of Lightroom to edit my photos, but there are paid options that offer more functionality. Photoshop Fix is a bit more advanced than Lightroom. I love this app because there is the functionality to remove objects/people/imperfections from your image. You can also highlight and choose to change the lighting/colors on specific parts of an image. I use the free version of Photoshop Fix to edit my photos and usually do the first edit in Lightroom then edit in Photoshop fix. I use A Color Story to filter my Instagrams after I’ve used Lightroom and Photoshop Fix. I love A Color Story because the filters are easy to adjust & understated. There is also the functionality effects like light flares to your pictures. I use the free version of the A Color Story app. 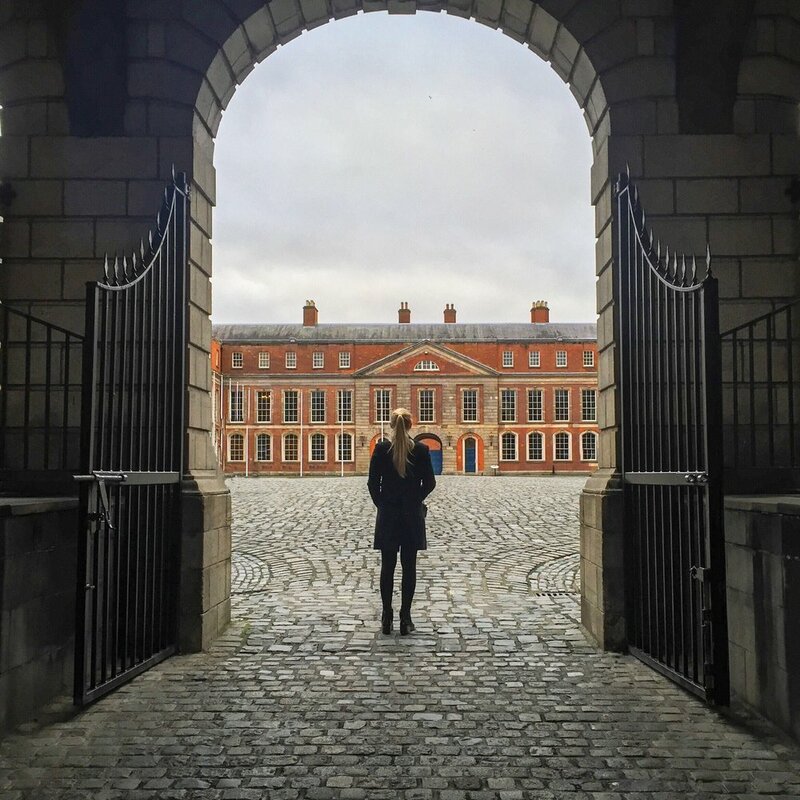 For this example, I’m starting with a picture that I took in 2016 of my sister, Emily, in Dublin. There are a few things that I love about this photo- the symmetry, how it is not your standard Dublin site, and the pop of red on the brick castle. Despite the good bones, there are a few items that I don't like about this photo. The picture is dull because of the lighting and low-quality camera that I used, and there are people and an ambulance in the background. The first step in my editing process is to work in Lightroom. I first turn the brightness to 100% on my iPhone. Then I open the picture I'm editing in the Lightroom App. In this example, I only use Lightroom to straighten the image and slightly adjust the lighting in color. Less is more. It's much more difficult to tone down a picture if you make drastic adjustments to color and lighting early on, so I prefer to edit in phases. Next, I use the Photoshop Fix app to remove the people and Ambulance in the background. Removing items from a picture can get tricky. In open areas, I use the 'Spot Heal' tool. Spot heal works well but can distort the image if you are near edges like the arch in this picture. To get the edges looking right, I use the clone stamp tool. Clone stamp mimics whatever area you select such as the cobblestone in this picture. One of my favorite functions in Photoshop fix is the ability to adjust saturation or lighting on specific areas. This feature is great in situations where you are looking to bring out the color in one specific building or if you are editing a picture of a person. For example, if I want to make the colors of an outfit more saturated, you can select just the outfit and avoid adjusting the color of a person's skin. In this example, I decided to saturate the red brick on the castle. After adjusting the brick saturation, I finalized my edit in A Color Story using the 'Everyday' filter. These apps have been a game changer for my Insta-game, and I hope that you love them as much as I do. If you have any questions on how to use any of these apps, please comment below.